A cruel, counterproductive piece of legislation is moving through the Pennsylvania legislature. Senate Bill 6 reduces assistance for the most vulnerable in our communities by punishing them for past mistakes, simple errors, or even a stroke of good luck. The bill would impose: a 10-year ban on assistance for people with certain drug-related convictions, a 1-year ban for poverty-level lottery winnings, and a heavy fine on people who need a replacement benefits card. SB6 would also expand felony charges for benefit fraud to include people who mistakenly receive the wrong benefit amount. Oct. 17 update: This bill has now passed both chambers of the PA legislature. Send Gov. Wolf a letter urging him to VETO SB6 using our quick and easy form. Hurt women with drug convictions by banning them from receiving assistance benefits. SB6 places a ten-year ban on TANF for women (who make up 90% of TANF recipients) with certain drug-related convictions. Research shows that keeping former felons from accessing benefits makes it more difficult for them to successfully re-enter society, increasing recidivism. When Pennsylvania had a similar ban in the past, criminal justice and drug policy experts, women’s drug treatment professionals, and domestic violence programs saw first-hand that the ban on public assistance sabotaged women’s recovery prospects and made the drug problem worse, not better. Even though this ban is much more narrowly tailored than the one that was eliminated in 2003, re-instating the ban for any felon is a step backwards. SB6 lowers the threshold for when welfare fraud becomes a felony offense, turning low-level offenders into felons, which is costly and unnecessary. Anyone who commits welfare fraud already becomes disqualified from benefits and must refund the overpayment. Many low-level offenses, however, are due to ignorance about rules and reporting requirements, or honest mistakes about the correct amount to be received, rather than purposeful deception. Branding people as felons for as little as $1,000 of fraud is cruel. It would make it harder for them to find work, push them out of society, and keep them from getting back on their feet. SB6 changes the fee for a second replacement EBT to a harsh $100 dollars. For most people – not just people who are financially struggling – $100 dollars is a lot. If your bank charged $100 for a lost ATM card you’d be furious, but at least you could still access your account other ways. Benefit recipients can’t access their benefits without an EBT card. For some households receiving cash assistance, $100 may be a third of their monthly income (a two person TANF household only receives $316 a month.) Besides being a harsh penalty, this policy would violate federal rules. SB6 requires that DHS prompt the Office of the State Inspector General OSIG) to investigate anyone with three or more EBT card replacements, ignoring the current policy already in place that monitors replacements. Very low- income folks are forced to move a lot, especially those that lack a fixed residence. People who are couch surfing, evicted, or staying in shelters tend to lose things. Multiple EBT card replacements already trigger warning letters, and OSIG already investigates suspected fraud. This extra scrutiny will most likely waste resources and bog OSIG down by cases they would not otherwise need to investigate. Lastly, SB6’s lottery lump sum rule is also punitive in nature. There are federal rules already in place to prevent lottery winners from defrauding assistance programs. 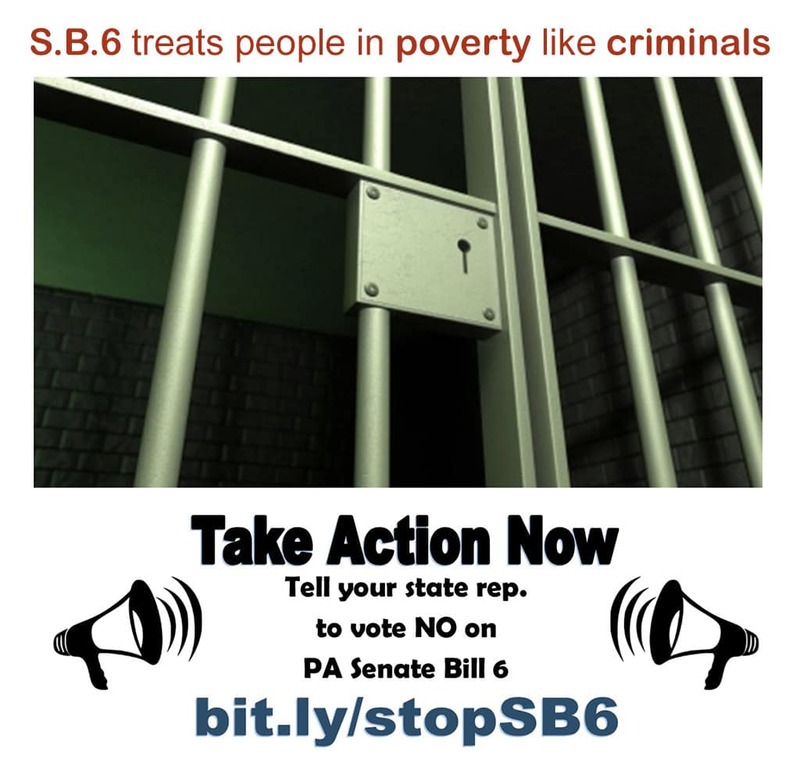 SB6 goes above and beyond that, harming people with only moderate winnings. Cash assistance barely covers the basics. Yet SB6 revokes cash assistance for a year for TANF recipients who win as little as $1,000 and General Assistance recipients whose winnings are only $250 — even when those winnings wouldn’t lift them above the poverty line. Moderate winnings could help them afford a long list of things (e.g. a used car so they can get to a job, home repairs, clothes and supplies for their kids, etc.) that they need need but cannot buy. SB 6 won’t further reduce any assistance program waste, fraud, and abuse, which existing policies are already working to keep at remarkably low levels. It will instead cost taxpayers and our society a great deal in unneeded investigations, in preventing low-level offenders from finding work, and by restricting access to benefits for people who need them. It is cruel and ineffective.